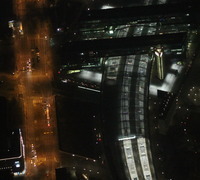 All photos are copyright © 2011 Christopher Kyba or © 2011 FU Berlin. 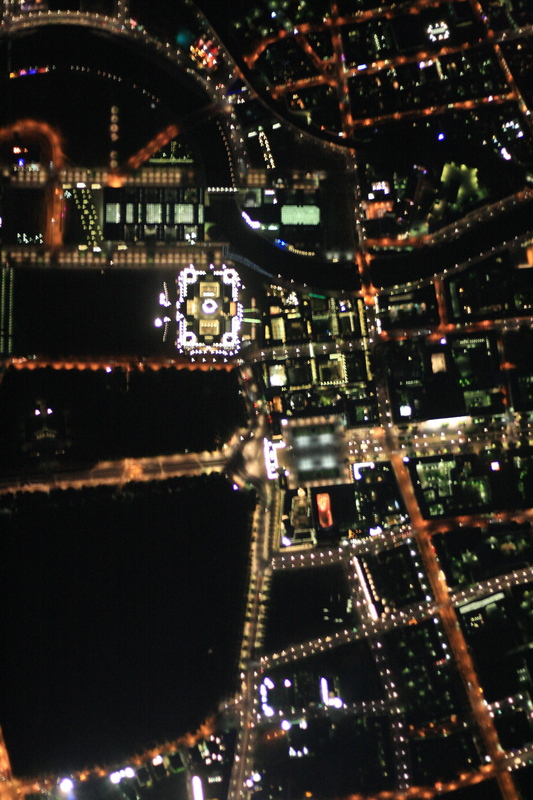 With the exception of the photos explicitly released under the creative commons license, the display of any of the high resolution versions of these photos is permitted only as part of an educational, scientific, or light pollution awareness/advocacy presentation, poster, or pamphlet, and provided that you acknowledge either "C Kyba" or "WEW / FU Berlin" as the source. The thumbnail images may be used on a blog, provided you include a link to this page. Without our written consent, reproduction of any of these images in whole or in part, on the web, in print, or for any commercial or media use is prohibited! Please contact me if you wish to obtain a license for the use of these photos or thumbnails for any purpose other than the exceptions stated above. Click on any thumbnail to view the full size image. Videos are at the bottom of the page. 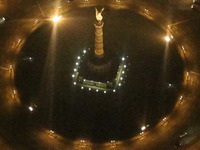 The Victory Column near the center of the Tiergarten (info). 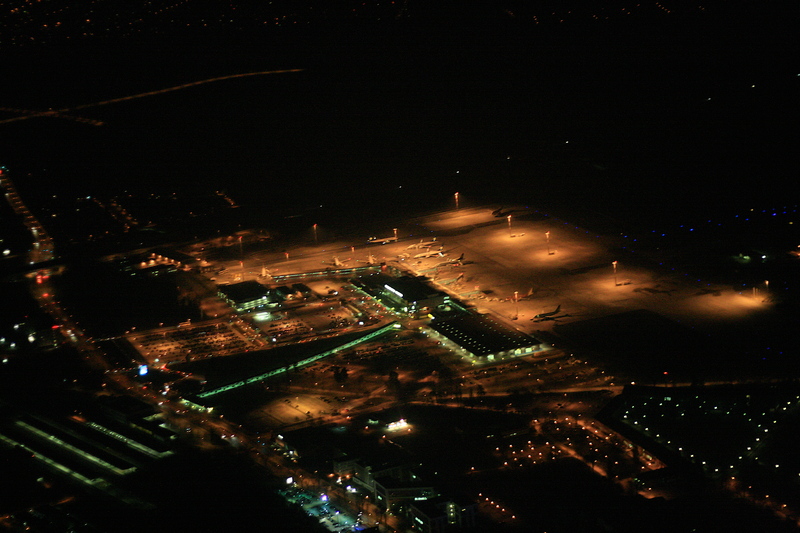 A wide angle view of Tegel airport. 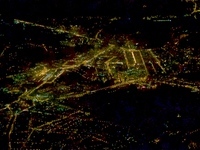 The surrounding area is quite dark, but suffers exceptionally from the skyglow produced by this single bright source of white light. 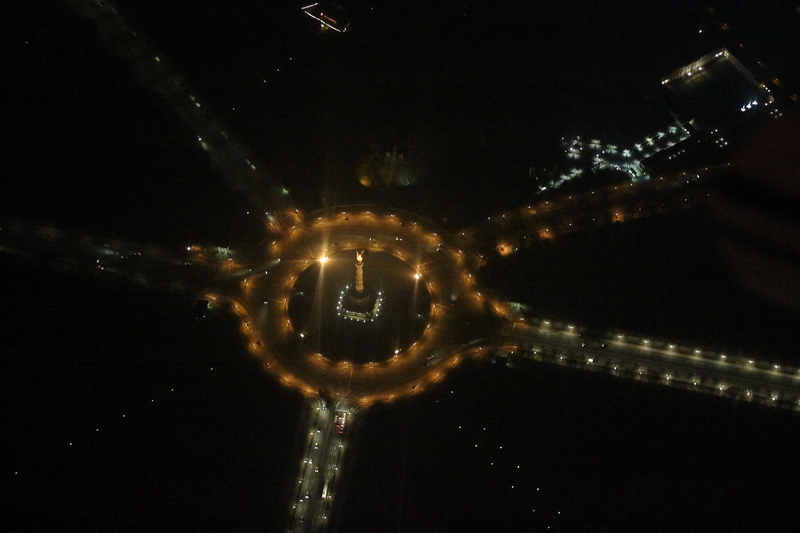 A view of the Brandenburg Gate and the German Reichstag, looking East (from above the Tiergarten. 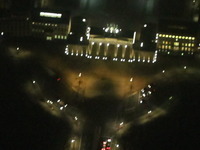 A view of the Brandenburger Gate and the Reichstag looking West (from above Unter den Linden). 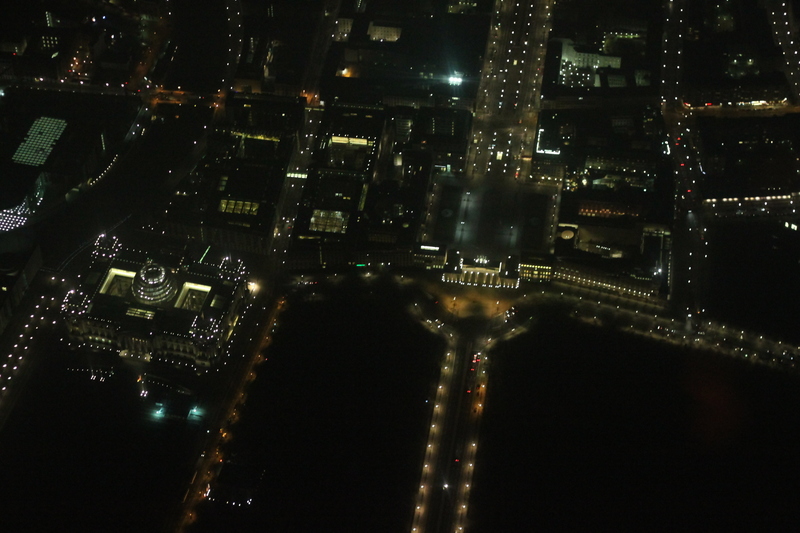 This photo was taken through the nadir viewing port in the aircraft as we passed almost directly over the Reichstag and Brandenburger Tor. A two minute video below shows the view through the port over a large section of Mitte. 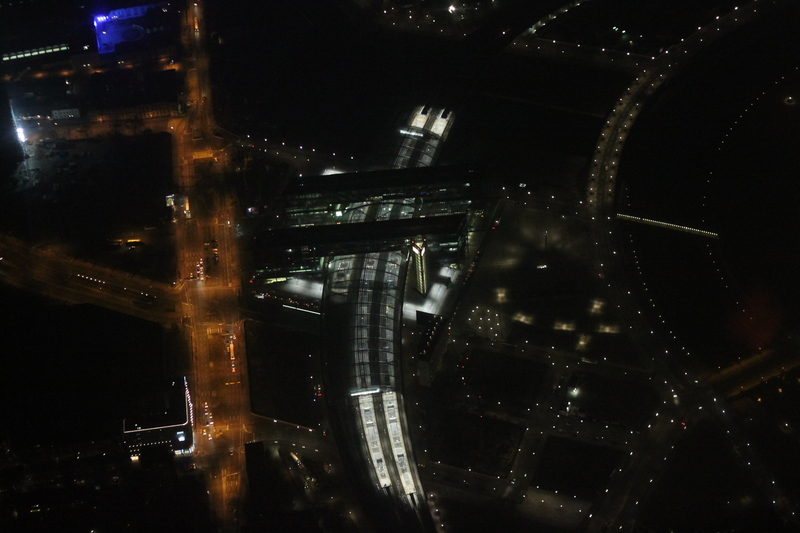 Another view of Berlin Hauptbahnhof. 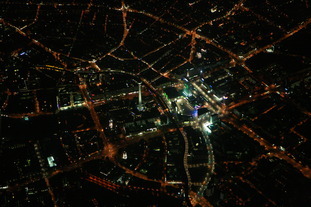 A mosaic image of central Berlin at night made up of thousands of individual aerial photographs. 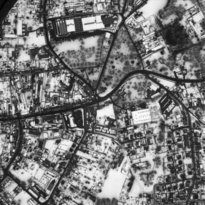 For comparison to the above photo, this image, based on the famous DMSP/OLS Earth at Night dataset, covers roughly the same area. 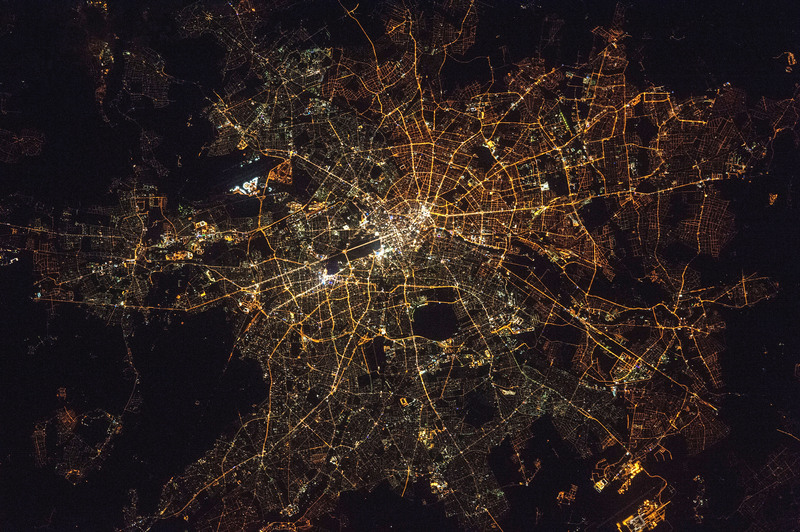 This is highest quality image of Berlin at night taken by astronauts aboard the International Space Station that I am aware of. 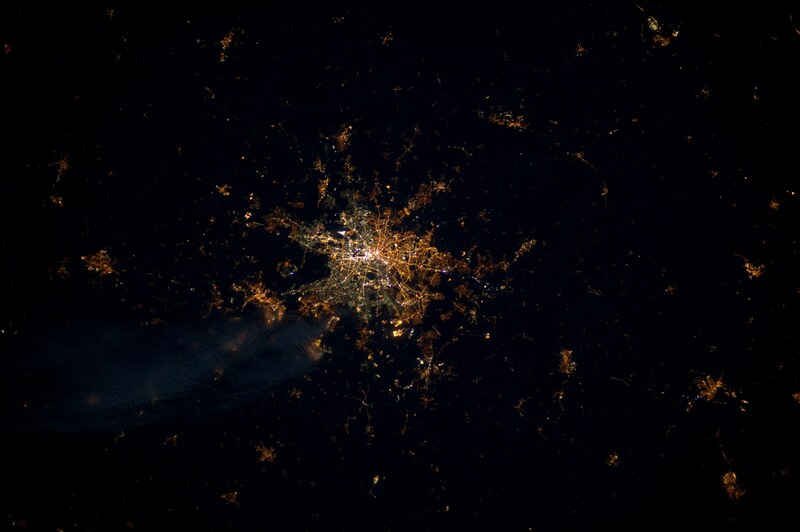 The image was taken in 2016 and is courtesy of the Image Science & Analysis Laboratory, NASA Johnson Space Center. Thanks to Alejandro Sanchez de Miguel for directing me to it! The previous best I know of is available here. 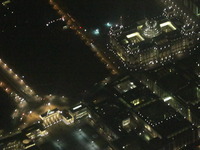 A wideangle view is also available. 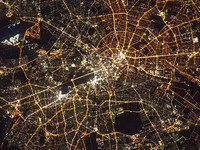 A blown up view of the region near Tegel airport from our mosaic image of Berlin at night. 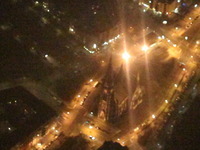 This image shows two of Berlin's most famous churches (Berliner Dom and Marienkirche), as well as the Marx-Engels Forum and the spire of the Rotes Rathaus. 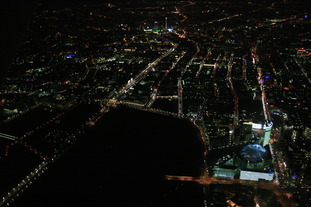 This view of one of the most historic areas of the city is dominated by copious blue light from a modern building. 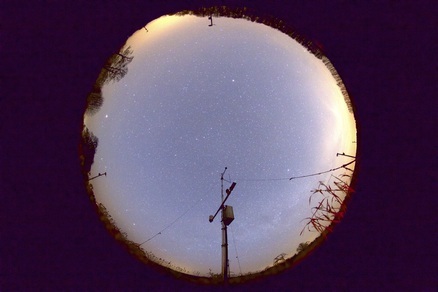 Besides spoiling this view, blue light produces far more skyglow than lights which emit longer wavelengths. 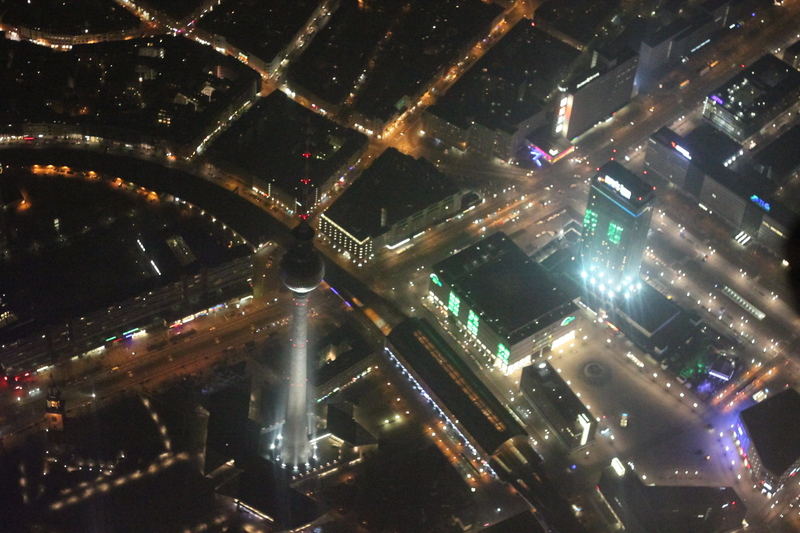 A wider angle view of Fernsehturm and Alexanderplatz. These false color images show how light pollution obscures the lunar "celestial compass". 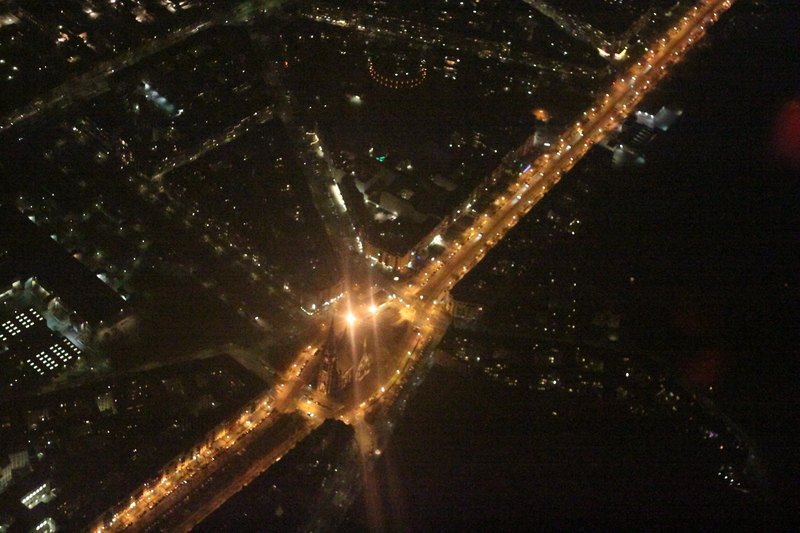 The signal at right is used by some nocturnal animals for navigation, but in the city it is no longer visible on most nights. Click on the image for a more detailed explanation. 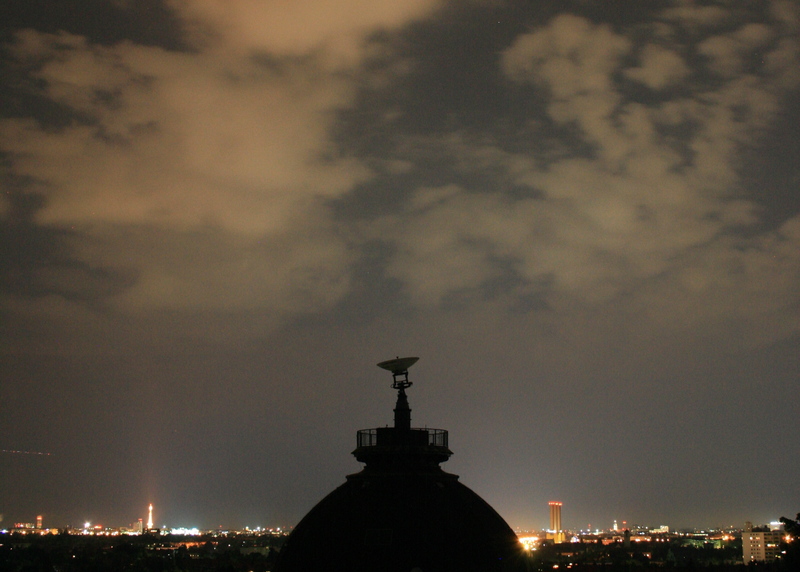 This photo was taken from the top of our measurement tower at FU Berlin, where we perform our skyglow experiments. 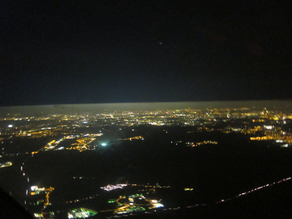 It shows how clouds amplify the impact of light pollution. 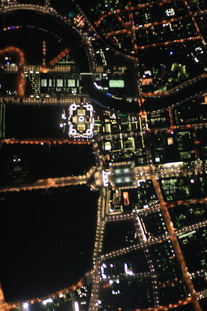 In natural areas clouds appear as dark objects in the night sky, while in urban areas clouds brightly reflect light back to Earth. The bright orange tower at left is "Funkturm Berlin". This photo was taken by Ray Stinson, and shows how clouds darken prinstine skies. 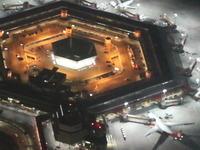 The two photos are displayed side by side here. 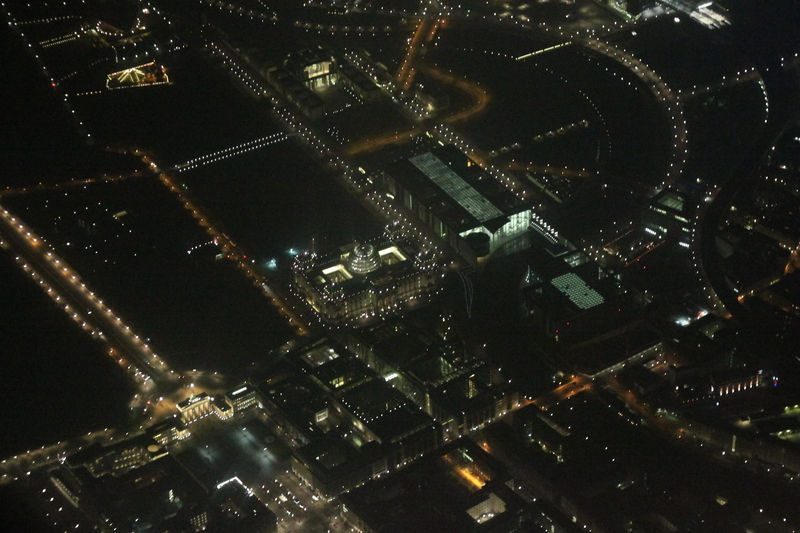 Berlin's Mitte district, with Tiergarten at bottom left, and Alexanderplatz at top center. 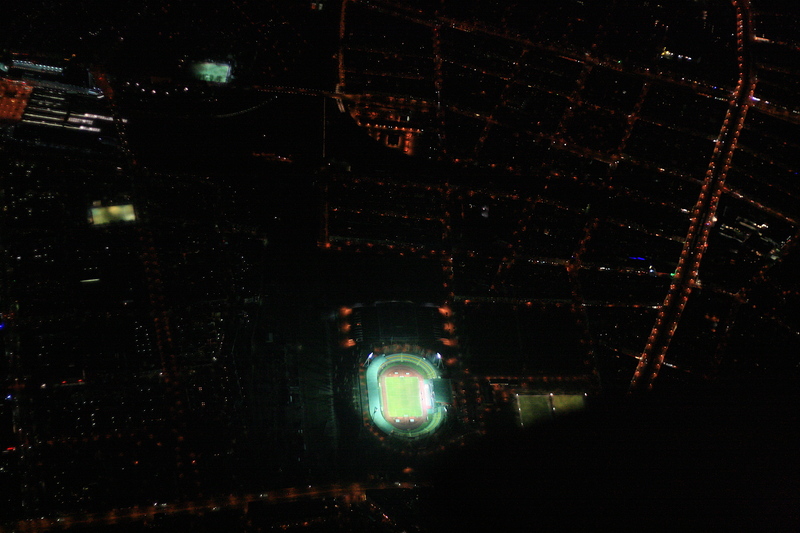 When flying over the city at night, stadiums and soccer fields jump out at you as very bright sources of light. 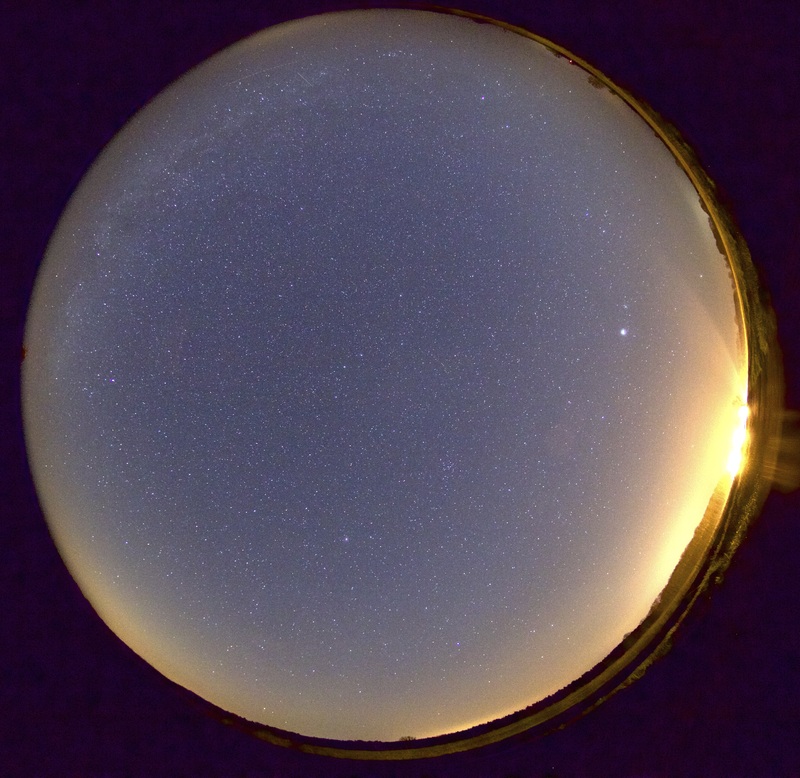 This image shows how light pollution is strongly scattered by aerosols below the planetary boundary layer, but not so strongly scattered by the clean air above. The Cessna that we use for our flights over the city at night. There is a hole in the bottom of the aircraft over which a motion stabilizing platform is based. 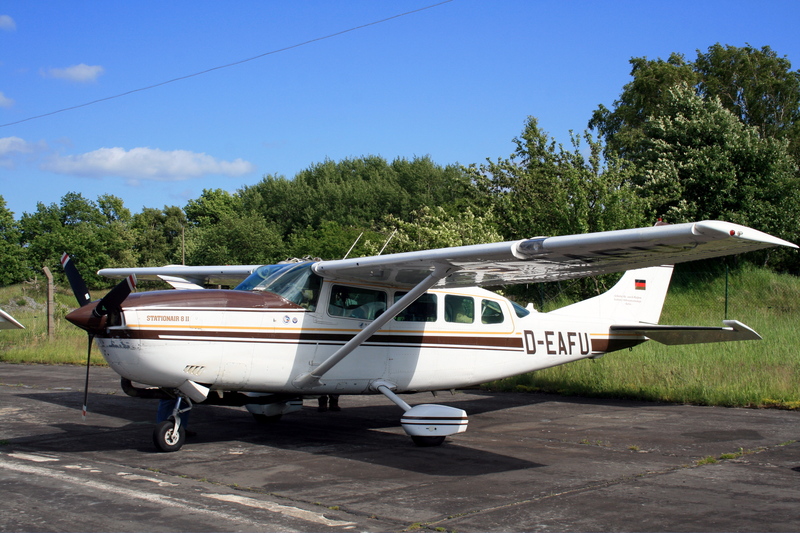 Our scientific cameras are mounted on the platform to compensate for the motion of the aircraft. Most of these images on this page were taken with my personal camera pointing out of the window. 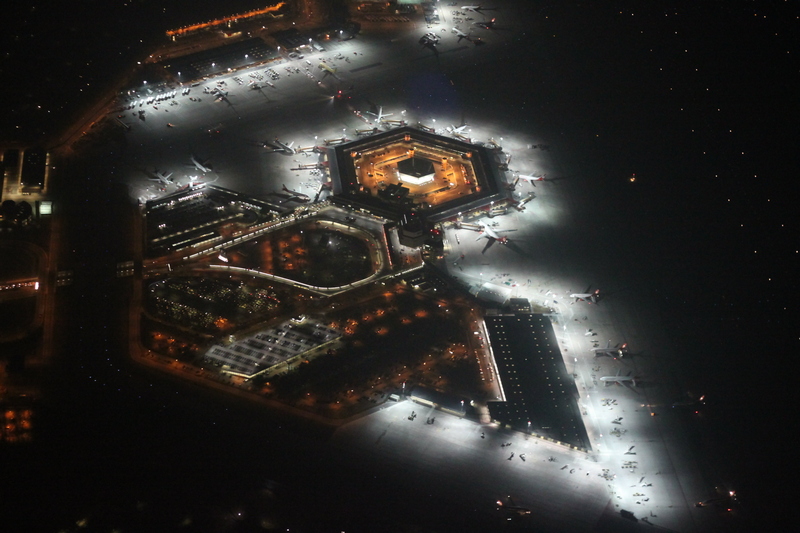 Taking high resolution photographs at night from an aircraft requires an exceptionally light sensitive camera. 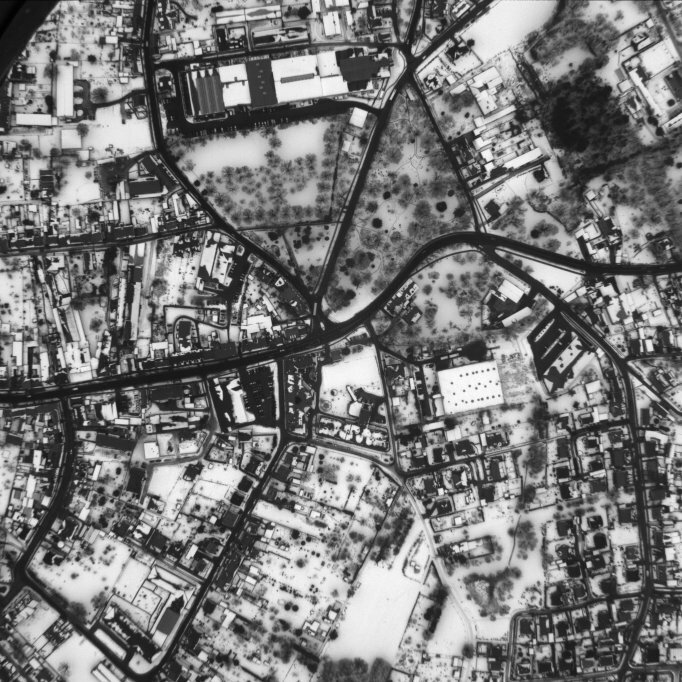 Much finer details can be resolved during the day, as this test photo from one of our early daytime flights shows. An image of the USA taken from the VIIRS DNB instrument on the Suomi NPP satellite during the lunar eclipse of October 8, 2014. The Verlust der Nacht field site at night, shortly before moonrise on April 11, 2015. 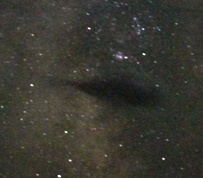 The contrast was turned up to show the blue sky (from lunar twilight) and the Milky Way. View original image here. 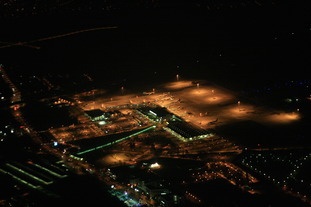 Another view of the same area from a short distance away and with the experimental lights turned on is here. Alejandro Sanchez de Miguel put together this video showing views of Berlin at night from our aircraft. 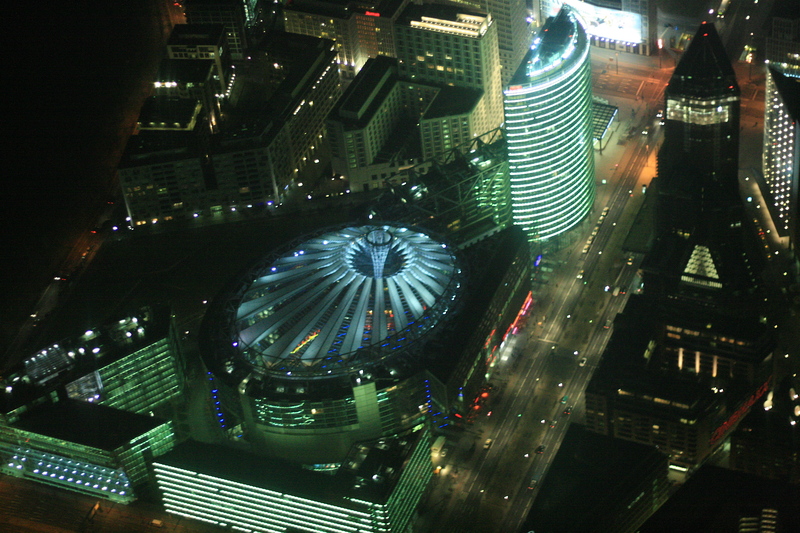 If you like it, take a look at this older video showing a flight segment from Alexanderplatz to Ernst-Reuter-Platz. 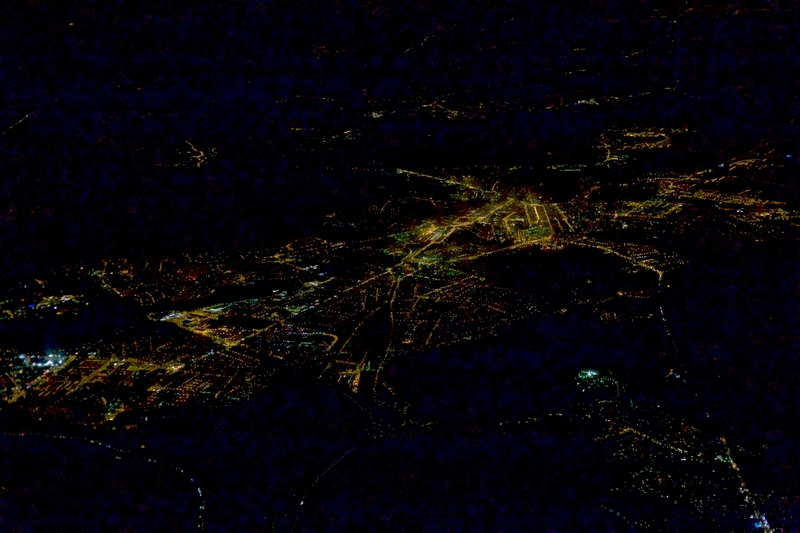 This video shows what it's like inside of the aircraft when we fly at night. Click on full screen or watch at youtube for better resolution. 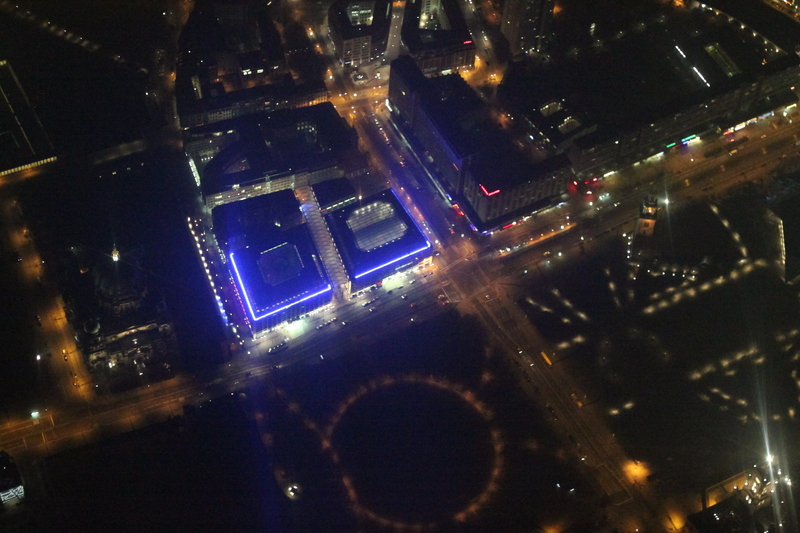 This is a ten minute talk I gave about light at night for a "Science Slam" in Leipzig. The first minute or so is in German, but the rest of the talk is in English. In this three minute talk I discuss why citizen science is an appropriate tool for doing skyglow measurements. In this four minute video I explain my sciencestarter project (German). 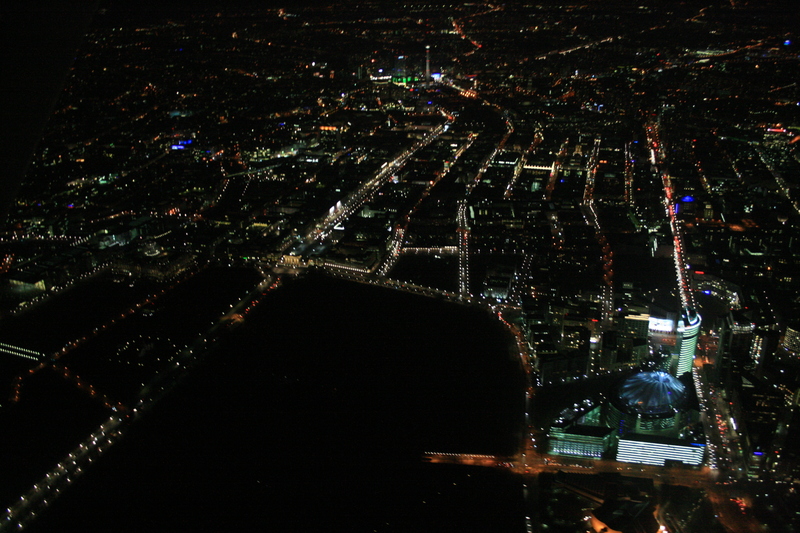 This is a three minute talk I gave about how the skyglow from urban areas blocks the view of the celestial compass. This is a 9 minute Science Slam about demographic changes in our experiences of light and darkness. 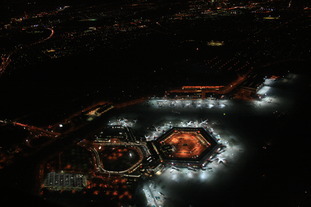 TRT World video in which I discuss issues related to light at night. Christopher Kyba vom Helmholtz-Zentrum Potsdam beim “Giant Science Slam” in der Stadthalle Braunschweig, 20.10.2017 from Deutschlandfunk on Vimeo. My (German language) talk at the "Giant Science Slam" for the 10 year anniversary of Haus der Wissenschaft, where I talk about how our biases harm science.